I learned something in this business class I've been taking one night a week. If this is true, then my learning is at warp speed right now! I'm accelerating it left and right! Just about every day, as a matter of fact. I've already posted some of them, in relation to seed starting. I tell you, it has been a struggle! Our vegetables are popping right up, easy as you please, and meanwhile the flowers are coming here a little and there a little. Mostly--a little. At least my dahlias are growing, bless their tuberous little hearts! Still only have about 3 cosmos that have come up. 3! Cosmos are usually unstoppable! The cosmos jungle from my Washington garden. If I don't get more coming up in the next few days I'm going to have to reseed. I have already reseeded the bachelor's buttons that were no-shows = most of the row. Sigh. 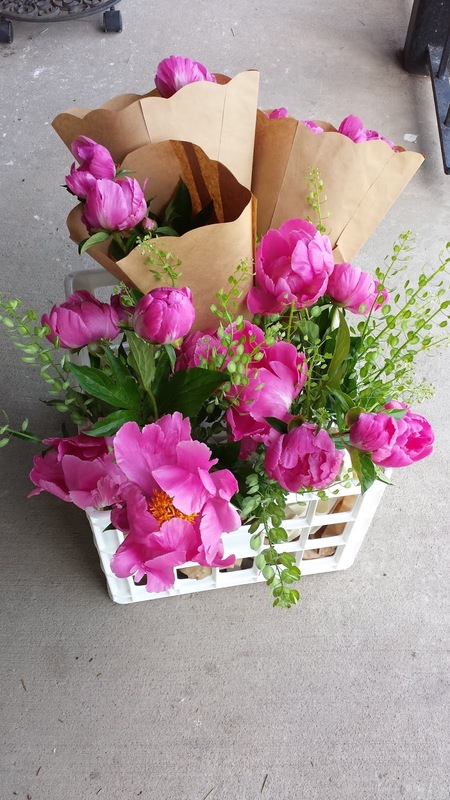 In the meantime, the owner of the store where I have my booth has very graciously allowed me to cut her peonies (from her front yard--she is wonderful), and I have purchased some perennials for my flower beds that I will be able to cut from right away. I have continued to forage for filler in my back yard/weed patch. I do have to say--that has been pretty awesome. I found a bunch of pennycress (which you can buy seeds for, and plant on purpose and everything!) growing amongst the thigh-high weeds in my unfinished greenhouse. I've been cutting that for filler. Then just today I happened to identify the weed with the pretty little purple flower at the tip as alfalfa. I have no idea how it will do as a cut, but I'm going to try it tomorrow and see how long it lasts! Slightly worried about customers with allergies to alfalfa, but it wouldn't be to the fresh stuff, would it? More like the hay? Anyway...more accelerated learning coming my way! My youngest brother, who served a mission for our church in the Czech Republic, said that someone told him that it would take a million mistakes to learn to speak Czech fluently. So he decided that he would make them as fast as he could. He spoke Czech to anyone and everyone, making many mistakes along the way. By the end of his 2 years there, he was fluent. Maybe that's the same with this flower farming stuff. I guess as long as I'm LEARNING from my mistakes, then it's all good, right? Especially since my family doesn't have to depend on this business as our main income at this point. One thing I have learned as I have struggled with getting my annuals going from seed, is that I need to plant a whole bunch more shrubs and perennials to get me through, just in case. I feel confident growing them--that's what gardening is all about. I can do that! However, I have not given up on seed starting and annuals. I am determined to become really good at it. It will save me so much money in the end, if I can just get the darn things to grow! Even growing perennials from seed myself instead of paying expensive nursery prices would be awesome!! I also need to figure out how to harden them off without going crazy or inadvertently killing the hardy few that have survived my ineptitude so far. Hardening off is such a pain in the neck! In 5 years, when all this has become easy and no problem, I will probably look back on this post with a rueful smile and just shake my head. Or maybe not. By then I'm sure I will be busy accelerating my learning in other areas. Thanks for sharing your thoughts and insights on accelerated learning! I love the way it helps reframe mistakes. It will help me think of my mistakes and those of people around me with more patience.